The Winnipeg Jets made the playoffs for the first time since the move to central Canada. They made it without superstars, but rather with depth. The Jets carried legitimate top-nine scorers on their fourth line at times between Jiri Tlusty and Lee Stempniak. With the loss of both of those players, plus Michael Frolik and Jim Slater, the Jets have quite a few openings in their roster. A team with so many holes would often look to free agency to fill the gaps, but it looks like the Jets will turn to internal options. I was hoping to go back, but from what my agent told me, they were looking to some spots to young guys. They have some very good prospects there that they were looking to give some ice time to. I don’t think we ever fully closed the door on it, but at this point, if I had to guess, it doesn’t look too promising. So what does this mean for the Jets and Jets fans alike? The combination of Tllusty, Frolik, and Stempniak hurts the Jets in depth and their overall talent level, while Slater opens an additional roster position. The return of Alexander Burmistrov alleviates some of this loss, and there are some legitimate reasons to be excited for his return, but only fills one of the four gaps. It currently stands that the Jets have three spots up for grabs at training camp. AAV is the average salary per season for the player’s contract. Goals Above Replacement is a holistic attempt to measure a player’s total contribution to the team, and in this case is extrapolated to per 82 game season over the past three seasons. While the Swiss pro league may be a possible alternative, it is either NHL or QMJHL for Nikolaj Ehlers due the NHL-CHL agreement. Ehlers tore up the QMJHL scoring 264 points combined over 144 regular season and playoff games combined. The average QMJHL player who scored at Ehlers’ 2014-2015 pace posted 40 points in the NHL the next season. It’s safe to say that Ehlers has already developed well beyond the competition of Canadian major junior hockey, but questions exist on whether or not he is physically ready for NHL hockey. Nik Ehlers is not the only “Nick” that has scored a slew of points in junior either. Over the past three seasons Nic Petan has posted 406 points over his last 247 games. Petan has played most of his time as a centre in the WHL but has played wing, including some time with Team Canada at the World Juniors. Petan graduates to pro this season. It is possible that the Jets feel Petan’s time is best served with the Manitoba Moose, refining his offensive and defensive game; however, some will recall that Petan looked extremely comfortable last pre-season. Petan made it difficult for the Jets to send him down, and may do so again with one more year of development under his belt. Another strong contender is the big and skilled forward Joel Armia. Prior to being traded to the struggling St. John’s IceCaps, Armia had scored 58 points over 92 games in the AHL and was near a point per game player in his sophomore season for the Rochester Americans. Even earlier in his development, Armia was one of the youngest prolific goal scorers the Finish Liiga had ever seen. As a new addition to the Jets organization, very few have had the pleasure to watch Armia. Armia has a deadly combination of size, skating, and hands capable of handling different situations and roles. The final major contender is Andrew Copp. Copp spent the past two and a half seasons as the top line centre for the Michigan Wolverines in the NCAA. While never eclipsing a point per game pace, Copp’s 81 points in 107 games still displays some scoring upside while playing an extremely mature and defensive aware game for his age. Copp has a bit of a head start against his competition too with already playing a regular season game in the NHL last year. There are a few darkhorses that could surprise as well. Brendan Lemieux has the strength and grit combined with skating that many desire in a bottom-six role, although his defensive game has some holes that may need time to develop. For Lemieux it may be more of a question of when not if, but he will need to learn a bit of restraint. JC Lipon has spent two seasons in the AHL now, and while his scoring numbers did dip last season, he played on a team that scored 29% less goals than the year prior. Similar to Lemieux, Lipon plays an aggressive and physical game, although both need to learn where the line is to avoid penalizing their own team. Scott Kosmachuk is another possibility. While not as physical as Lemieux or Lipon, Kosmachuk also plays a gritty, drive-at-the-net type game. Kosmachuk also carried a fairly similar learning curve as Adam Lowry in their rookie seasons, so Kosmachuk may come in and surprise much like Lowry. The Jets will be looking for up to three of these prospects to make the team and hopefully contribute in a meaningful way. It is a gamble as the Jets are lacking in capable veteran depth options to fill the gaps. Matt Halischuk, Anthony Peluso, Patrice Cormier, Chris Thorburn, Matt Fraser, and John Albert (if extended) are a far cry from the depth that Jiri Tlusty, Michael Frolik, and Lee Stempniak provided. If the prospects are not ready, we could see the Jets taking a substantial step back. Totally agree man. If the young guys are able to step in and play really well, the Jets will take a step forward. But, if they don’t, then the Jets will be in trouble. 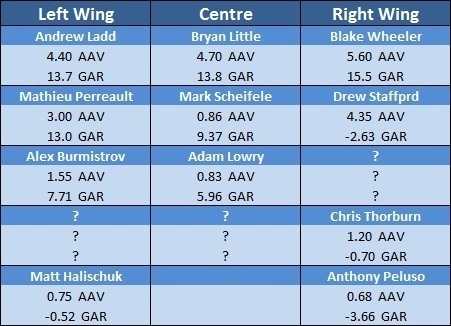 Resigning Tlusty or Stempniak for a bit of stability would be nice, they can always be flipped for picks to make room for prospects. But, we’ll see if that happens. The added dynamic of Ladd and Byfuglien going into contract years will also make this season very interesting. Are these the guys the team wants to build a Cup contender around? Would the team be better off trading one or both for more young pieces and try to contend 2 years down the road? Either way, I’m looking forward to what the season brings. Originally I was enthusiastic about the Jets and their youth movement, but now I am concerned that they might have gone too far. There are three positions on the Jets that the young guns will fight over, but are there enough young guns? They will take time to develop and I am anticipating that the first 30 games will be a one-step-forward, one-step-back process for the team since these guys will need to learn their way. Then there is the Manitoba Moose. That team will likely struggle. Last year the team was poor, and this year will likely do worse. Why? The scoring should be even more anemic. The four of the top five scorers for the Ice Caps have left with John Albert still being unsigned. Who is going to score for the Moose if the Jets are pressing the young guns into service? I hope I am proven wrong, but I am anticipating that both the Jets and Moose will struggle, for different reasons, but winning games just got harder this year.